This week in Israel is the Workshop on Innovations in Algorithmic Game Theory, which has been a collection of amazing talks and I thought of blogging about something new I learned here. First, Paul Goldberg gave an amazing talk about the Lemke-Howson algorithm and Homotopy Methods. Later, during the poster session Jugal Garg presented the impressive work on an exact algorithm for finding Nash equilibria in rank 1 bimatrix games. Both have in common the use of homotopy, which I found I quite cool idea – and has been present in Game Theory for a while, but I didn’t know about. They also have to do with improving the understanding we have on the Lemke-Howson Algorithm – a (potentially exponential time) algorithm to find Nash equilibrium in 2-person bi-matrix games, but that seems to work pretty well in practice. As always, I though that blogging about it would be a good idea in order to understand those concepts well. The best understood class of those games is the one where , called zero-sum games. For this class, computing a Nash equilibrium is very easy and it is given by the famous min-max theorem: player finds maximizing where is the -th unit vector. Similarly player finds maximizing . Then the pair of strategies obtained is a Nash equilibrium – and this verifying that is not hard. The intuition is that a point represents the fact that the payoff of player when player plays is at least . We could re-write as . 1. A vertex in corresponds to a point with labels. A vertex in corresponds to a point with labels. 2. The point corresponds to a fully-labeled point of , unfortunately this is the only fully-labeled point that doesn’t correspond to a Nash equilibrium. 3. By taking an edge of the polytope (which is define by labels in and labels in . We can move between two nodes that are almost fully labeled. The idea is to consider the set of nodes that are almost fully-labeled: fix some label and consider all the nodes such that . Those points are either , a Nash equilibrium or they have one duplicated label, since . An edge is composed of labels (no duplicated labels). So, one almost fully-labeled point that is not a Nash or is only connected to two other vertices via an edge (which correspond to dropping one of the duplicated labels and following the corresponding edge). where the blue dots are the Nash equilibria, the white dots are the almost fully-labeled points and the edges are the L-H edges. The number of Nash equilibria are odd by a simple parity argument. 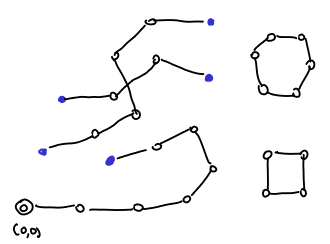 The classic way in which simplex-like methods walk through the vertices of a polytope is by pivoting. The same way we can implement Lemke-Howson. For an explanation on the implementation, please look at the chapter 3 of the AGT book. One can ask if we could modify the L-H path following to go through the path faster. Recently, Goldberg, Papadimitriou and Savani proved that finding the Nash equilibrium that L-H outputs is PSPACE-complete. So, in principle, finding this specific equilibrium, seems harder than finding any Nash, which is PPAD-complete. My current plan is on some other blog posts on Bimatrix games. I wanted to discuss two things: first the homotopy methods and homotopy fixed-point-theorems (which is the heart of the two papers mentioned above) and about new techniques for solving zero-matrix where the strategy space is exponential.